Vietnamese cuisine has received a lot of attention over the past few years. Unsurprisingly, this has garnered the attention of some famous faces, a few of which have come along to try it for themselves. Here’s our list of the top five celebrity chefs that have been to Vietnam and made it a part of their career. Perhaps better known these days for his fiery temper rather than his cuisine, Ramsay visited Vietnam in 2011 to shoot an episode of Gordon’s Great Escapes. Ramsay was enthralled by the abundance of fresh ingredients that go into Vietnamese cuisine, calling the local market a ‘chef’s dream,’ as well as being slightly perturbed by the broad use of certain ingredients. Ramsay’s newfound infatuation with Vietnamese cuisine comes as high praise from a chef whose restaurants have been awarded a total of 16 Michelin stars. Following his visit, Ramsay continued to celebrate Vietnamese cuisine by tasking the final five contestants of his TV show MaterChef US to prepare of bowl of hu tieu in 2013. It should come as no surprise to see Anthony Bourdain’s name on this list. A strong advocate of Vietnamese cuisine right up until his tragic death in 2018, Bourdain became something of a spokesperson for Vietnamese food in the west, even accompanying former US President Barak Obama to a meal out in Hanoi. 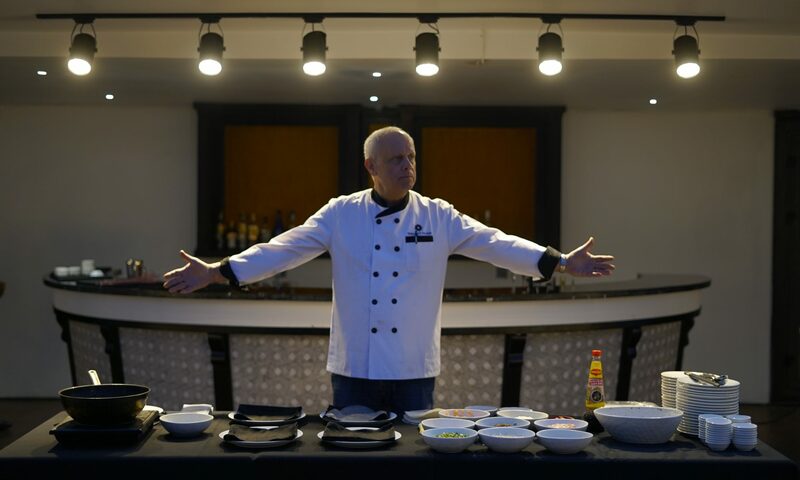 International celebrity chef Bobby Chinn, born in New Zealand to Egyptian and Chinese parents, has, perhaps, the strongest link to Vietnam – literally putting his name to the country in 2001 with his restaurant: Restaurant Bobby Chinn. After an unpleasant back injury in 1996, Chinn decided to move to Vietnam to learn the art of Vietnamese cuisine under street food vendors. Chinn eventually took his love for Vietnamese food back to the west, opening up his Vietnamese restaurant House of Ho in London. These days, Chinn’s celebrity status is on the rise as a judge on MBC’s Top Chef Middle East, broadcasted across the Middle East and North Africa. Ha’s position as judge on MasterChef Vietnam has made her a popular household name in Vietnam, but her fame goes beyond borders. Her celebrity career actually started as a contestant on season three of MasterChef in the US. Ha was the first-ever blind contestant on the show, winning the coveted title and a $250,000 cash prize. Ha’s cuisine throughout the show reflected many of Vietnam’s traditional dishes. Born in Singapore to a British diplomatic father, John was destined for a globe-trotting career, spending much of his youth traveling with his family. John claims that these formative years have gone on to inspire his culinary style to this day. In 1983 John cut his culinary teeth under renowned chef Raymond Blanc at Le Manoir aux Quat’Saisons, where he was soon promoted to sous chef. 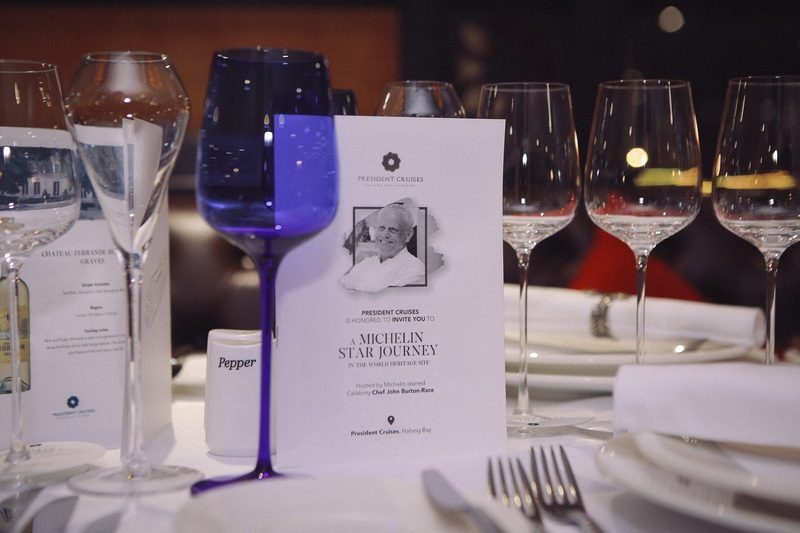 John impressed Raymond so much as sous chef that, when Raymond opened Le Petit Blanc in Oxford, he put John in charge of the restaurant and the kitchen, this is where John was awarded his first Michelin star. 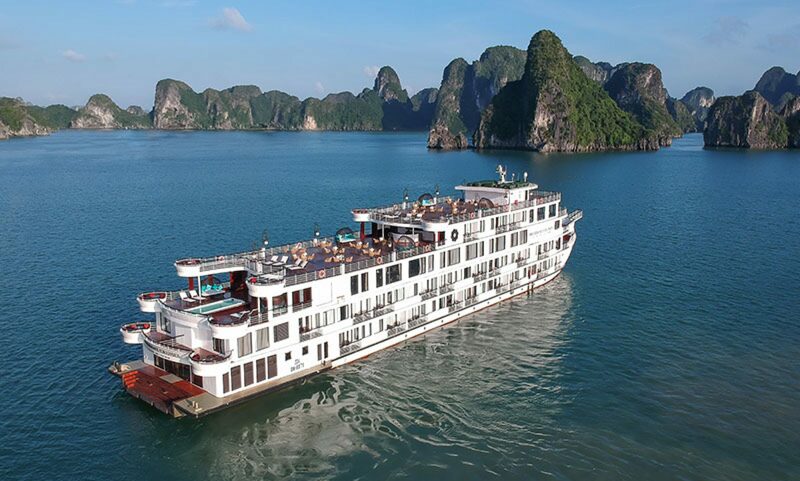 John visited Vietnam in January 2019, stepping aboard President Cruises, Halong Bay’s most glamorous floating hotel, to share his world-class culinary knowledge. Besides the Michelin standard cuisine that he’ll bring with him, we expect that Vietnamese cuisine will leave an inevitable imprint on John. 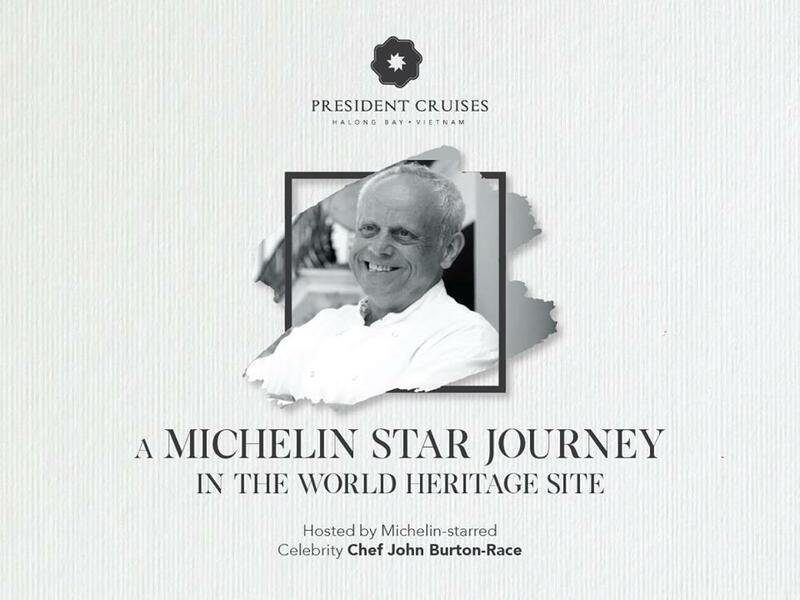 At President Cruises, we’ve recruited help from celebrity chef John Burton-Race to craft our Michelin standard menu. As a multi-Michelin Star holder with a background in global cuisine, we knew John would be the man for the job. But what is a Michelin Star exactly? And how does one receive one? Stemming from unassuming roots, the Michelin in Michelin Star does in fact come from Michelin, the tire company. It started back in 1900, when the UK-based tire manufacturers launched their first guidebook, encouraging people to take a road trip in France. This expanded in 1926 when they recruited anonymous reviewers to go out and try different restaurants. To this day Michelin still uses the anonymous reviewer approach, where each reviewer must blend in with the scenery and not make themselves known. Their system has changed a little over the years, however. As Michelin are somewhat understaffed (one former inspector revealed that, at the time, there were just seven in the whole of the US) there have been a few extra steps added. First of all, food websites and blogs are combed for the best-reviewed restaurants and added to a pile. A scout will later be sent out to dine in the restaurants that have been dug up and if it’s outstandingly good, a memo will be sent to an inspector. If the inspector finds it remarkable too, the restaurant will likely be visited again, and maybe, if lucky, awarded a star. One star: A good place to stop if you’re passing by, offering cuisine cooked to a consistently high standard. Two stars: Worth a detour, indicating excellently prepared cuisine, skilfully and carefully crafted dishes or an outstanding quality. Three stars: A restaurant worthy of a special journey, indicating exceptional cuisine, where diners can enjoy a superbly crafted meal. Though, as suggested before, it is popularly believed that these rules have deviated a little. This is backed, somewhat, by the amount restaurants that currently hold stars. In the GB and Ireland Guide, for example, there are just five restaurants with three stars, 20 restaurants with two stars and 150 with one star – suggesting that there are just 150 restaurants in GB and Ireland worth popping into if you’re passing by. Michelin fought back against claims that their standards were somewhat pretentious or French-centric in 2016, when they awarded a one-star rating to two Singaporean hawker food stalls, where diners line up to buy meals for just $2.00. While there are certain criteria that a restaurant must uphold, such as their location, which has to be within the boundaries of a Michelin guide (currently any restaurant in Hanoi would, for example, be off limits) a Michelin star remains the highest point of nobility for any restaurant. While restaurants in Hanoi or Halong Bay obtaining a Michelin Star might currently be out of the question, Michelin Star standard dining is still well within reach. If you cruise with President Cruises, you’ll see this for yourself. Known in Vietnamese as ‘Tet,’ Lunar New Year is the most important holiday in Vietnamese culture. You’ll find that big cities like Hanoi are suddenly very quiet, whereas sleepier areas like Sapa are overrun with local tourists. Each destination will have their own unique character around Tet. The main piece of advice when traveling over Lunar New Year would be to book any travel or hotels well in advance. Most people will be traveling to their families, so public transport gets booked up fast. When it comes to hotels, it may be that some aren’t open, making rooms harder to come by. Here’s our advice on Tet and how it shapes northern Vietnam’s three most popular destinations: Sapa, Hanoi, and Halong Bay. There are many good reasons why Sapa gets so busy during Tet. This hillside town has plenty going on, and many Vietnamese take advantage of the time they have off to enjoy this mountain destination. But for many, a big part of the appeal of Sapa is its distinctive rice terraces and villages, with a diverse and interesting ethnic makeup. Depending on when Lunar New Year falls, Sapa will usually be pretty cold. Temperatures reach highs of 13 degrees Celsius and lows of 7, which in the crisp mountain air can feel very chilly. Staying in Sapa during Lunar New Year will provide many of the normal appealing factors: hikes with stunning views, interesting tribe cultures, charming homestays and awe-inspiring nature. Around this period, though, Sapa livens up a little more and you’ll be able to try some traditional Tet foods, such as chung cake, te cake, pickled onions, and dried bamboo, along with the chance to marvel at the beautiful peach flowers. If you like the cold and don’t mind the crowds, Sapa is worth considering. Tet is a chance for residents of Hanoi to visit their families in more rural parts of Vietnam. This means the whole city essentially shuts down, leaving a few major restaurants and a portion of Hanoi’s Old Quarter still open. While this quiet milieu may appeal to some, it does, unfortunately, mean that visitors would be missing Hanoi’s erratic charm. Due to the lack of people within Hanoi during Tet, one of the top recommended activities would be walking around the capital city’s various lakes. A stroll around West Lake or Hoan Kiem Lake is an activity unlike the conventional Hanoi experience: one of peace and tranquillity in an otherwise hectic city. Hanoi will usually start to thaw out around Tet, moving away from the colder months of December and January, with temperatures starting to climb to up to 21 degrees Celsius. While this is a suitable temperature for walking, you may experience some light downpour. 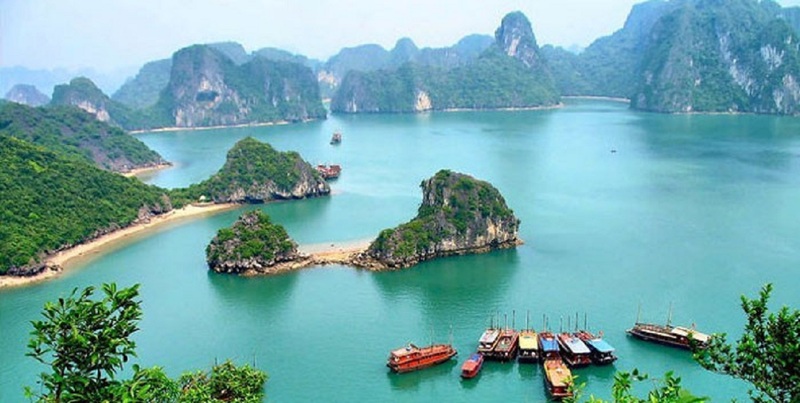 Halong Bay might be the ideal location in northern Vietnam during Tet. 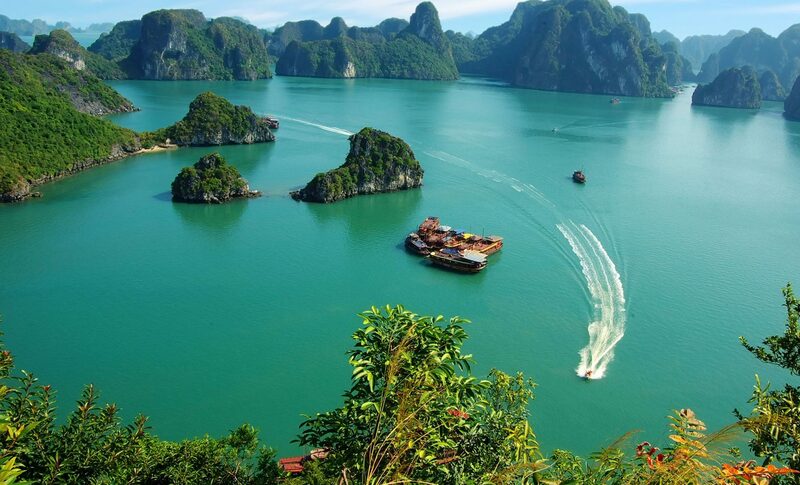 Unlike busy Sapa and quiet Hanoi, Halong Bay remains almost unphased by holiday inconveniences. Cruise-goers aren’t reliant on public transport, so getting to and from destinations is no great difficulty. The same is true of eating and entertainment. Cruise companies like President Cruises won’t allow the holiday chaos to impact on the quality of their cruises. With a relatively unchanged atmosphere throughout Halong, the bay is a fantastic place to ring in the Lunar New Year. The weather is warm, though not unbearably hot, with highs of 21 degrees Celsius and while it does drizzle, there are no torrential showers. Note that you may want to bring an umbrella. Most importantly, you can travel carefree knowing that the national holiday won’t get in the way of your holiday.